Läuffer: Brandon Wiley. Gussie von Berg: Margery Fairchild. Major von Berg: Ryan Hayes. Mrs. Von Berg/Maîtresse d’: Meg Hurtado. Leopold “Lippel” von Berg: Himself. Let me begin by saying I loved this production. It is funny, thought provoking, staggeringly original, full of experimentation and theatrical verve. Then, let me add that everything about it is, well, more than a little bit eccentric. No, that’s not quite it. Odd? Queer? Weird? Peculiar? Confounding? All that. Heck, just look up any of these words in Roget’s and you’ll get the idea. 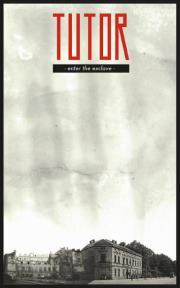 Dark Porch Theatre presents "Tutor: Enter The Exclave" at EXIT Studio. Photo Credit: Dark Porch Theatre. Mr. Schwartz studied German literature at a university in Berlin, and has earned an MA from the University of Chicago in the field of contemporary post-dramatic German theatre. He is a Thinking Director. God help us. But I digress. To continue our tale, Mr. Schwartz set out to translate the schizoid Lenz’s The Tutor, a play, Schwartz explains in a two-page annotation to the press kit, “whose characters always walk the line between the grotesque and the piquant” and in which “a barely explained self-castration just barely misses being funny.” Who could resist this? Ultimately, the heroic Schwartz abandoned his translation in favor of a new play “inspired” by the plot of The Tutor which he titled “Tutor: Enter The Exclave“. Exclave? Oh, I’ll explain: an exclave (thank you Wikipedia) is “a territory legally or politically attached to another territory with which it is not physically contiguous”. Like, for example, the Vatican or the United States Naval Base at Guantanamo. Or, in Schwartz’s metaphorical understanding, the theatre in the modern world, or a family cut off from its roots, or a politically alienated party, or an underclass or… or… or…. Get it? Here we have an opportunity to explore deep themes. The plot, such as it is, involves the arrival of a tutor to an eccentric middle class family. Mama is both seductive and brutal; Papa is insane and violently controlling; brother is a puppet; Sis spends her time narrating her life out loud while ignoring any interactions with those around her (until she finds herself pregnant). Oh, and remember the self-castration mentioned earlier? It makes a bizarre appearance before the evening is through. This quite wonderful production is not for the faint of heart. To attend, you must make your way to a storefront theatre in the very bowels of the Tenderloin (a daunting pilgrimage). To appreciate, you must make an equally daunting intellectual and aesthetic effort. But it’s hella worth it. You should go. Posted in Reviews.Tagged Brandon Wiley, Britney Smallwood, Dark Porch Theatre, Exit Studio, J. M. R. Lenz, Margery Fairchild, Martin Schwartz, Maxx Kurzunski, Michael D. Poloskin, Ryan Hayes, San Francisco Theatre Reviews, sturm und drang, Tutor: Enter the Exclave".